Do not panic if you got into an accident, give D Motorwerkz a call. From accident recovery to legal advice, they will be able to assist you with their professionalism. 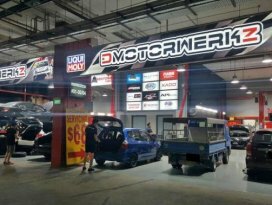 D Motorwerkz opens till 10pm (Mon-Sat) and 6pm on Sun. From oil change to major overhaul & spray painting, regardless of a passenger car, mini-van or SUV, their highly experienced mechanics are qualified to work on a variety of car makes and models with different diagnostic equipment for different models. They offer comprehensive automotive services that are designed to keep your vehicles running like new. Sent my car for servicing twice. The boss and her sister were friendly, and charges were reasonable. Great that they open till late too.